Send and receive secure and anonymous email. Share files online securely. 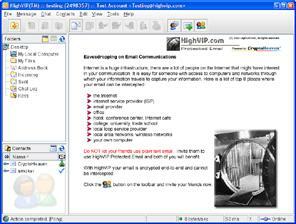 Chat and exchange secure instant messages, create secure message boards. Share document folders through easy to use interface. Communication and collaborate with your co-workers and friends accross networks and firewalls with very high level of security without a need for expensive VPN, PKI or complicated network administration, setup and maintainance. Formally comply with privacy and security provisions of: HIPAA, GLBA, SEC 17a-4; NASD 3010 2048 to 4096 bit Asymmetric and 256 bit Symmetric Key Encryption, Automatic Key and Contact Management. Your data and your information stored in our Secure Data Center are illegible to anyone without your private key and passphase. Changes: Implemented a search funciton for all encrypted content.